The Okavango Delta is the world's largest inland delta. It is formed where the Okavango River empties onto a swamp in an endorheic basin in the Kalahari Desert, where most of the water is lost to evaporation and transpiration instead of draining into the sea. Each year approximately 11 cubic kilometres of water irrigate the 15,000 km² area. Seen from above, the delta looks like a giant outstretched upsidedown hand. From what I understand, the Okavango River used to continue flowing south, through the Kalahari Desert and eventually joined with other rivers (possibly the Limpopo) on its way out to the sea. Then, 2 to 4 million years ago, regional uplift south of the present-day delta blocked the original course of the river and caused a 'superlake' to form. 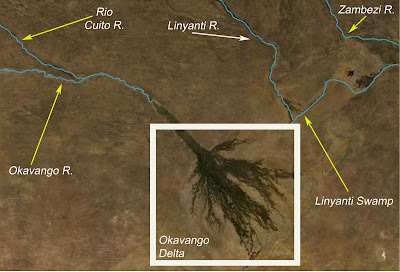 It is thought that several rivers, including the Okavango and Linyanti Rivers, emptied into the lake. Eventually, and possibly due to additional tectonic activities, the superlake lost its feeder rivers. The Linyanti took a quick dog leg to the east and the Okavango began emptying into its current swampy basin. All that remains of the superlake is a few desolate salt pans. source here. We were staying at a tent camp in the Okavango called Xigera, pronounced 'Key-ja-ra'. I spent a good four months looking at that word on the itinerary, not having a clue as to how it was pronounced. So there you go. Xigera was a tiny camp on a tiny island. To get there, we flew to the landing strip on Chief's Island and then hopped aboard tiny canoes for the trip through the canals to the island. But first we had to wait for the plane to arrive. It was hot out. Here is one of our awesome tour companions. Eh. I like small planes. I really do. I just don't care much for their safety records. Especially in Africa. The ones we travelled in were piloted by ex-South African military personnel so that made me feel slightly more comfortable. The delta is a massive maze of waterways and floating papyrus mounds. 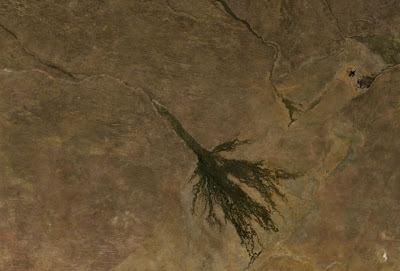 The hippos have carved mini-channels between pools for navigation purposes but since much of the plant life is floating, the shape of the delta changes constantly. Islands are formed during the dry season when termites create mounds. Eventually plant life is deposited on the mounds and the islands grow as the plants gain footholds and accumulate leaf litter. 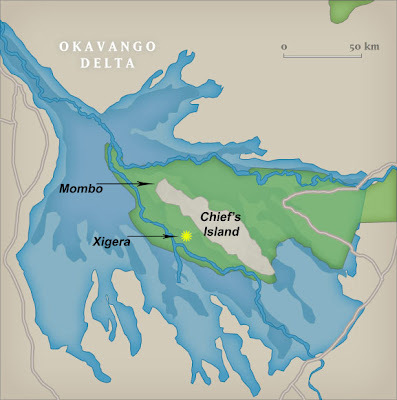 Once we landed on Chief's Island, we hopped into mokoros (dug out canoes) and headed for Xigera. Heading downstream among the floating papyrus islands. And thus begins my most favorite part of the trip. The lions and elephants of Linyanti were awesome, and the river at Selinda was beautiful, but the Okavango had something that was indescribable. I've never been in such an environment. The birds were spectacular and the wee little creatures (ahem. frogs) were fascinating. Maybe because we were traveling via canoe (ie the slow boat) and we were almost at water level but I felt like I could see a lot more of the passing countryside. It was also non-motorized so animals probably weren't as threatened by our passage. Also, I finally was getting the hang of the camera (only took two weeks!) and I found the challenge of photographing avian life to be especially pleasing. I am most happy, out of all the pictures we took, with our bird photographs. And maybe the frog ones. An elephant had died on one of the islands. Our guides told us that elephants from the same family group occasionally came back to visit the bones of this one. The skull was too large for the hyenas to consume. Ivory is heavy. That sucker weighed a ton. Lechwe are found in marshy areas where they eat aquatic plants. They use the knee-deep water as protection from predators. Their legs are covered in a water repelling substance allowing them to run quite fast in knee-deep water. The Yellow Billed Stork in flight. With an African Openbill behind it. The Malachite Kingfisher (Alcedo cristata). My mom would have loved this bird. The colors fit her perfectly. My second favorite part of the trip, after the dugout canoes, was a walking tour on one of the larger islands. Here our guide is gingerly holding up a furball. A wee ball from a household kitty this ain't. It's leopard size. Safari trekking. It was wild. And it got quite exciting when we almost ran into a slumbering cape buffalo. Without a gun and fully aware of the buffalo's grumpy reputation, it made for few tense moments. On our trip to Mombo (a full day's adventure) we hopped aboard the water version of the safari truck. Despite the presense of the cats, dogs, and elephants, the Okavango really truly belongs to the hippoe. He dominates the pools, the channels, and, at night, the grass outside of your tent. The African Fish Eagle (Haliaeetus vocifer). And one of the biggest treats of the trip, a spotting of the Pel's Fishing Owl (Scotopelia peli). A rare find. So, our dugout canoes weren't original dugouts. They were the cheater epoxy versions. Which was ok since it meant that they weren't cutting down lovely old trees (which are hard to come by, in this part of the world). The Striped Skink (Mabuya striata) that lived outside of our tent. And we will close with the red lechwe. I like the frog looking right at you. Great picture! Every area of the Okavango Swamp is known for its own particular habitats, resident herds and familiar predators. Wildlife enthusiasts can also reveal secretive animals like porcupine, aardwolf and genet during night drives in private reserves.